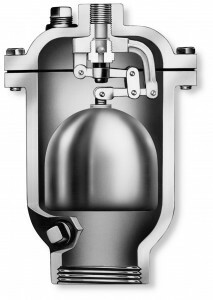 Fuel Service Air Release Valves operate while pressurized allowing entrained air to escape from the fuel pipeline, pump or reservoir tank through the air release orifice. After entrained air escapes through the air release orifice, the valve orifice is closed by a needle mounted on the compound lever mechanism actuated by a CONCAVE FLOAT to prevent fuel from escaping. The Fuel Service Air Release Valves have a built-in air check device to prevent air from re-entering the system during negative pressure conditions.